Good writing is an indispensable part of a strong inbound marketing presence. We now find ourselves having to blog regularly, build web pages, create marketing offers, and post social media updates nearly every day. It’s time to equip yourself properly for this new role of a publisher. 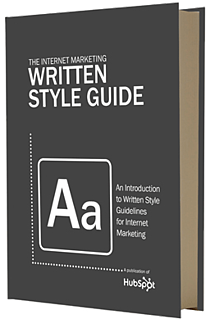 Download The Internet Marketing Written Style Guide to ensure that you’re publishing content that is well written, persuasive, and trustworthy. Improving your writing across different marketing channels will solidify the credibility of your brand and help you build an image of a thought leader in your field. BONUS: By downloading this guide, you'll also receive a free editorial calendar template to streamline your content creation!